1. 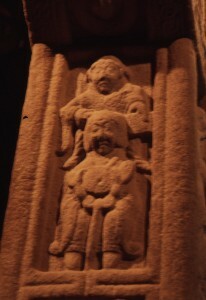 Clonmacnois. Detailed View. Cross of the Scriptures. South Side. (?) David as shepherd two figures are shown frontally, the lower one is wearing a long robe and holds a shepherd's crook, the upper figure is winged suggesting that it depicts an angel guarding the lower figure. Astle, Th., , ‘Observations on Stone Pillars, Crosses, and Crucifixes’. In Archaeologia 13 (1807) 208-222.